In this collection, the authors develop a mathematical model of kinetics’ adsorption in solid microporous mediums. This approach allows for the introduction of two new terms in Fick’s law: The first term characterizes the direct adsorption, represented by random function and dependent on the average speed but not on speed itself. The second characterizes the fluctuation of adsorbed quantity and heat dissipation, phenomena which are at the origin of irreversibility adsorption and desorption. Next, residual enzyme activity was investigated to monitor stabilization/destabilization of hen egg-white lysozyme at low, intermediate, and high water content in acetone at 25 oC. The results demonstrate that the stabilization/destabilization of lysozyme depends significantly on water content in acetone. Another study is presented with the goal of providing a thermochemical description of the stabilizing/destabilizing effects of organic solvents on the enzyme stability to elucidate what intermolecular processes produce the main effect on the stability and functions of the enzymes at low, intermediate, and high water content in organic liquids. Following this, the authors examine the part that acetone may play in increasing the use of lignocellulosic biomass through exploitation of all constituents, especially lignin. 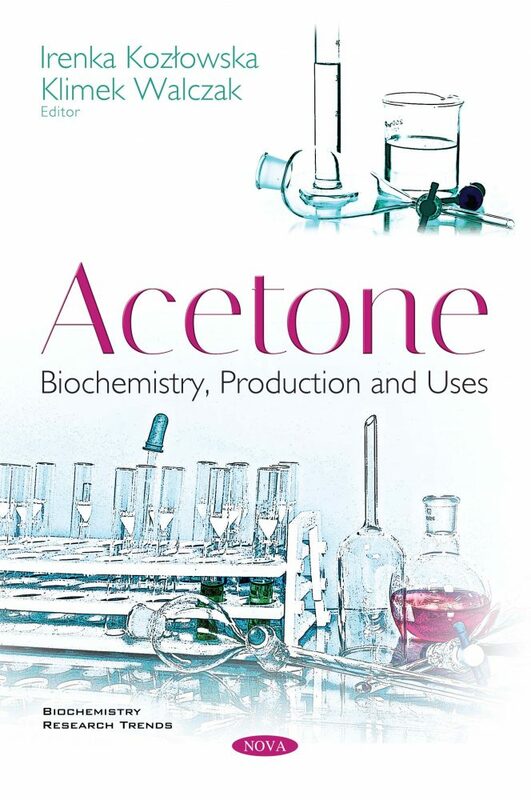 Examples include the use of acetone in studies of the chemical composition of LCB and the utility of acetone in organosolv pulping and pretreatment of LCB. With the commercialization of biorefineries, it is expected that acetone will continue to play a significant role in the processing of lignin, the most abundant natural aromatic polymer on earth with immense potential to reduce dependence on fossil-based aromatic products. The authors also propose an efficient acetone chemical sensor based on the analytical performances such as sensitivity, limit of detection (LOD), good linearity, and reproducibility. This proposed acetone chemical sensor was introduced by the implementation of ZnO/SnO2/Yb2O3 nanoparticles (NPs) as a successful electron mediator with glassy carbon electrode (GCE) assembly. The concluding paper presents an experimental system of isopropanol-acetone-hydrogen chemical heat pump (IAH CHP) for the recovery of low-grade (<100C) industrial waste heat. Using coefficient of performance (COP) and exergy efficiency as evaluation indices, the system performance is systematically evaluated based on the experimental data.